Product production is moving along! Last month we received our first batch of testing-ready watches and after making a few material updates, we are excited to share we’ve kicked off outside beta testing. 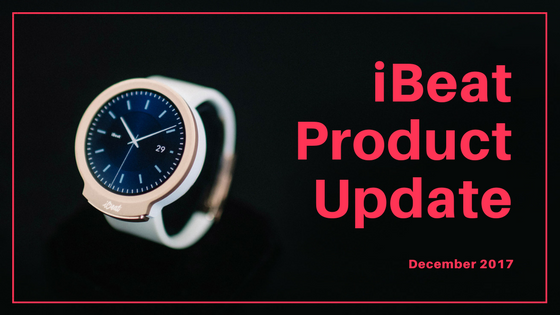 During this process, we’ll be collecting critical user feedback to ensure the iBeat Watch fits seamlessly into one’s everyday life, while paying close attention to comfort, durability, and overall usability. Once all testing requirements are met (and surpassed), we will move forward with full batch production. Hoping you all saw our November update with the latest shipping timeline, but we are targeting an April 2018 delivery. In the coming weeks, we will keep you updated on our beta testing and shipping progress. In the meantime, if you have any questions, concerns, or general feedback, please feel free to email us at support@ibeat.com. Thank you for your patience. It’s been an amazing year, and we’re excited at how much progress has been made. At the close of a great (and very busy) year, we’d like to gratefully pause to wish you a warm and happy holiday season.